We sell cardboard moving boxes Small Medium and Large. 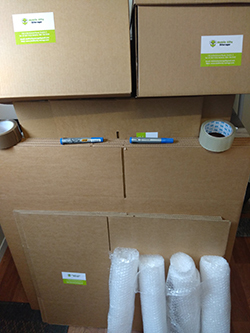 Also in our package supplies stock, we have large bubble wrap for larger more fragile items such as TVs, glass cabinets etc. Our smaller bubble wrap is perfect for ornaments and cutlery. We have the standard size clear tape for moving boxes along with tape cutters and box cutters. All of our padlocks are in sealed packs to ensure you are the only one with access to those keys. They come in three sizes; small, medium and large. To ensure all your goods are tied down correct, we sell white nylon rope. 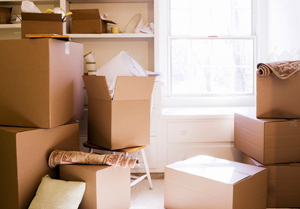 This is an ideal package supply if you are completing the move yourself. 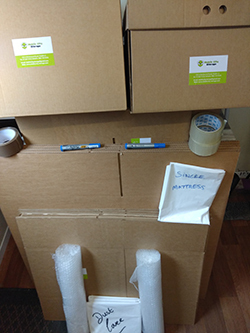 For long-term rentals and for transporting mattresses of all sizes, we sell dust covers and mattress protectors that are like a sleeve that will just slide over the mattress. All these covers protect the mattress if dropped while loading or unloading. 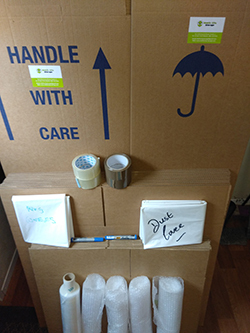 If you are moving, packing or storing, with our selection of packaging products you are sure to have all the right essentials to suit your needs all in one place. 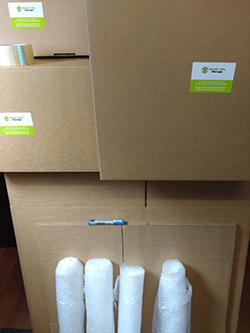 Our packaging supplies and boxes are reliable, durable, and cost-effective. Contact us today to discuss your moving boxes & package supplies requirements!! !